In a medium sized saucepan add chicken broth and dry farro to pot. Bring to a boil and reduce to simmer. Cook for 30 minutes. Fluff the farro with a fork, transfer to a bowl, and allow farro to cool. In the meantime, hull and quarter strawberries. Chop basil and pecans, set aside. In a small bowl to start make the dressing: whisk orange zest, orange juice, honey or agave, salt, pepper, and olive oil. 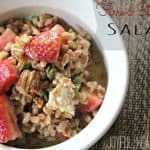 Pour the dressing over the farro and add the strawberries, basil, pecans, and crumbled goat cheese.